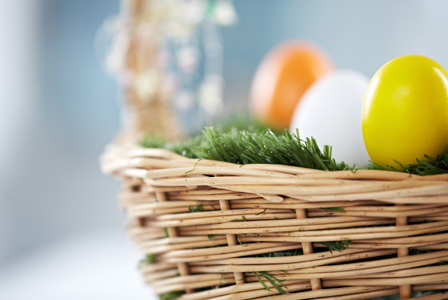 Whether you’re in a hurry or you just want to lower your stress level this Easter, follow these tips for making the perfect Easter basket that will appeal to any age! Add festive touches to your basket with sparkle and shine. Consider a sprinkle of Easter confetti or pastel-colored ribbon. If you want to get really fancy, add a glitter-encrusted handle. 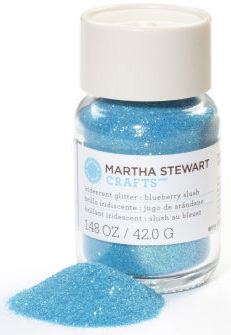 Try using Martha Stewart iridescent glitter for a that extra Easter glimmer to your Easter basket. Candy is a must-have in any Easter basket. (If your child’s a little on the energetic side, you may want to sneak in some sugar-free candy.) An essential Easter candy is chocolate — more specifically, Reese’s Peanut Butter Eggs. Also, jellybeans — more importantly, Starburst Jellybeans. 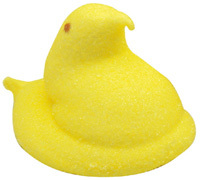 And, of course, Peeps — it’s just not Easter without Peeps. If your Easter basket recipient is over 21, then including a bottle of wine is more than acceptable. White wine is ideal because it’s light — by Easter, it usually feels like spring, so white wine goes hand-in-hand with the season. A bottle of sauvignon blanc or chardonnay will do the trick. If your recipient is more of a red wine enthusiast, then consider a bottle of a lighter red variety like a pinot noir or gamay. If you’re giving some Easter cheer to a minor, include some sparkling cider or sparkling juice! Every Easter basket has that special something to it. Whether it’s a present or a message, there’s always a main course in an Easter basket! To finish up your basket, add a gift card (it doesn’t have to be for a huge amount) to their favorite coffee shop or store. If your recipient is young, include a favorite toy or a book. For close friends, you can include a pair of fun socks or a fun Easter-themed top.